The Galaxy A3 (2017) and Galaxy A5 (2017) have been receiving the Android 8.0 Oreo update in Russia for a few days now, and it looks like the Galaxy A7 (2017) is joining the Oreo party today, only this time the update has been released in Vietnam. 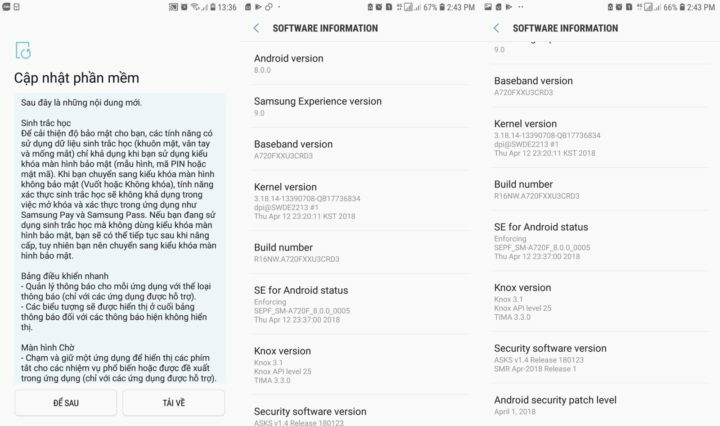 One of our readers has sent us screenshots of the Oreo update from the A7 (2017); the build number is getting a jump to A720FXXU3CRD3, and the update includes the April 2018 security patch. With the Galaxy A7 (2017) Oreo update rolling out, all three 2017 Galaxy A series models are now making the transition to the latest version of Android. However, as we had said earlier, the update is likely to take a few weeks to reach countries other than the one where it debuted for each device. The way Samsung works – leaving each of its regional arms to do things of their own accord – makes it impossible to say when an update will arrive for a particular region, and we’re even seeing the A7 (2017) getting the April security update in a few markets this week without Oreo, which should give you an idea of how things will proceed for many (if not most) countries. You can, however, keep checking if Oreo is available for your Galaxy A series device by tapping the Download updates manually option in the Settings » Software update menu. The Galaxy A7 (2017) Oreo update is 1.3GB in size, so it’s recommended to use a Wi-Fi for the download unless you have lots of data bandwidth available on your mobile data plan. For details on everything Android 8.0 Oreo brings to the table, check out our extensive coverage, but keep in mind that you may not get all of the new features and functionality that are included in the Oreo update for Samsung’s flagship devices. Seeing the Oreo update on your A7 (2017)? Let us know if you are by leaving a comment! Thanks, Lê Vũ Minh Khang! due to the disappointment of the samsung users then slowly the users start to leave the samsung brand mobile products and switch to other products .. if you guys are slow then do not be surprised one day you will go bankrupt .. only one suggestion from me if the same type and model of each country do os release globally ..
a7 2017 android 8.0 oreo %100 tam şarj olsa bile şarj olmaya devam ediyor. I got the April security update for the unlocked S7…guess I should be grateful that the all powerful samsung sends me any update. Wont be buying another “flagship” phone again. Guys Oreo Update comes at the 18 May in Europe! For S7 Edge/S7. The above given date is for turkey. Just notice that the A7 2017 series are now getting oreo but the turkey website still says that the update will available on 1st june. So don’t expect the update will be rollout on that time. And now the note 7 fan edition also getting oreo in south korea but, S7 not. @JERRICKGODVIN12 Yes, it’s almost a guarantee that this same thing will happen to S8 in 2019, and S9 in 2020. Now the mid-range samsung phones which is scheduled next to the S7|Edge are getting oreo update but the 2016 flagship devices still on nougat. I think we will get taste of oreo after the android P update for S9|S9+. And why the hell the update was postponed to mid may?, Is any guarantee that the same thing will happen to S8, S9 users in future..? S7 edge was the first Samsung mobile phone and the last one I bought! Samsung’s policy is horrible and unreasonable, congratulations! Will give up on my Note 8 (ZTO)…. Any one wanna buy?? Will never buy an samsung devices. I am an s7 user and impatiemtly waiting for oreo update. But I think Samsung is doing it right, first 2017 models then 2016, no matter whether it is a flagship or not. Why do we pay the extra money then? To watch others get their update? Foolish samsung. You paid extra money for better performance and not for updates. You’re just a mad dude with no clue. You can pay extra money for an s9/s9+ and get the oreo if you really think so. Chill out and wait, because your words and mine are not solving the issue. Happy waiting! Dude why should I buy s9 to get oreo? U pay money to get the services.Other mediocre devices getting the update ahead of us is unbearable. Dude but, S7 is an flagship. Dude i am an S7 edge user i am just kidding with him. Sumsung is taking revenge from S7. I think S7 manufactured by Taliban. Has anyone ever wondered about why Samsung isn’t able to rollout updates to more than one model at once? I mean, if they have so many models they should be able to keep up too.. Le A7 mis à jour avant le S7… Décidément Samsung continue de prendre ses meilleurs clients d’hier pour des idiots et des pigeons. cadê a atualização 7.0 do SM-G610M BRASIL ? Will never buy a Samsung phone again. cadê a atualização do j7 prime SM-G610M ?????? Way to abandon S7 users..Like seriously!! A8 2016 Android system very similar A7 2017.please roll out Oreo Update this phone. At last it come a news with this..Oreo update is rolling out for s5 and s6 before s7.. 😎 it’s a joke but is very very sad see this company going down and down..
Oreo for S5 and S6? What are you talking about?